The Berat tour was exceptional. My guide Ilir was simply the best and made it a truly amazing day. He is incredibly knowledgeable about Albania and seemed to know everyone we encountered. He personalized the tour based on my interests. Highly recommend! 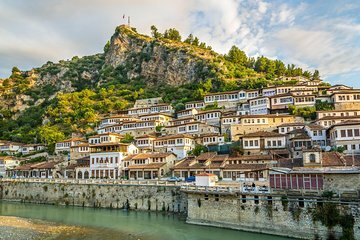 I had the pleasure of taking this tour to Berat with My guide ILIR, it was a excellent day, I could not recommend it more. ILIR was fabulous, both in his knowledge of Berat and the attractions we visited but he also gave an extensive understanding of Albania and its history. I couldn't recommend the tour enough. Just to add there is allot of waking over cobbled streets involved so wear comfortable shoes. Highly recommend this trip. Our tour guide, named Ilir, spoke excellent English and was very engaging and amiable. Expect a bit of a climb up to the castle, so no high-heels, ladies! After taking in the view and sights of the castle area, we took lunch on the way down at Restaurant Onufri, and were beyond pleased with the food. The owner was very nice and outgoing. This was followed by a trip to the town for a walk around to see the sights of the city. It was a day well spent, you'll be happy you booked it. Our tour leader was fantasic! And so was the tour group of 4 people who were all interested in the same things. I think what was unique about this tour was the trour leaders genuine interest in us and his indepth knowledge of the history of the area, his willingness to engage on current political issues including the current election, his obvious pride in his country and ability to relate it in a personal way lacing it with personal anecdotes and humour. Berat is of course beautiful and I was reluctant to leave . One extra unanticipated experiene - the best meal we have had in Albania in the shadows of the castle walls - hosted by an exhuberant restrauter - of those geniuses of hospitality able to share a dance, raki and a story with the food prepared by his family. The stuffed peppers would be the best I have every had! A great break from Tirana and a very interesting tour with an informative guide. The guide asked for preferences at the start of the tour, but didn't seem to actually tailor the trip that much. Good shoes with lots of traction are a must - the streets are very slippery and you walk all day while in Berat. Great tour and really good guide in Ed and driver Abdul. They showed us some great sites and were really flexible on stopping to get photos and also were very informative on the things we saw on the tour. Definitely recommend this tour and great value for whole day tour.